Bob Woodward, Bush at War. New York: Simon & Schuster, 2002, pp. 31-32. "President Pledges Assistance for New York in Phone Call With Pataki, Giuliani." White House, September 13, 2001; Elisabeth Bumiller and Jane Perlez, "The Overview; Bush and Top Aides Proclaim Policy of 'Ending' States That Back Terror; Local Airports Shut After an Arrest." New York Times, September 14, 2001. Dan Balz, Bob Woodward and Jeff Himmelman, "Afghan Campaign's Blueprint Emerges." Washington Post, January 29, 2002. "President Building Worldwide Campaign Against Terrorism." White House, September 19, 2001. "Remarks by the President at Photo Opportunity With House and Senate Leadership." White House, September 19, 2001. Karen Hughes, Ten Minutes From Normal. New York: Viking, 2004, pp. 267-268. "President Bush and Russian President Putin Discuss Progress." White House, October 21, 2001. "U.S., Africa Strengthen Counter-Terrorism and Economic Ties." White House, October 29, 2001. "President Delivers State of the Union Address." White House, January 29, 2002. Bill Sammon, Fighting Back: The War on Terrorism--From Inside the Bush White House. Washington, DC: Regnery Publishing, Inc., 2002, pp. 382-383. Rowan Scarborough, Rumsfeld's War: The Untold Story of America's Anti-Terrorist Commander. Washington, DC: Regnery Publishing, Inc., 2004, pp. iii. Excellent Work Shoestring! This leads to the 911 Wars. I hope we can see the connection to the 911 Wars. constitutional911 on Sat, 11/10/2007 - 2:29pm. Some will attack me on this and say this is off-topic. If you look at the big picture, I don't think so. The 911 President operates on HUBIS, SHEER ARROGANCE. His deceptive statements (see above) on Sept. 11 in order to lie to America & THE WHOLE WORLD should be proof enough. The impending war with IRAN is a Clear Indicator. I submit this for those who see, that the US with its failing dollar, is not necessarily the superpower she thinks she is. My point, as made clearly by many others, is to be careful about what this "911" President is doing. His foreign AND domestic policy. I hope we can see the relevance of this article below. It is important in the light of all the 911 deceptions and hubris. Thinking other nations will stand by and do nothing may the worst mistake to make. I am talking about the 911 EMPIRE he is trying to build and why others who KNOW may be capable of stopping him and his friends. Pls see the relevance. When the U.S. Navy deploys a battle fleet on exercises, it takes the security of its aircraft carriers very seriously indeed. At least a dozen warships provide a physical guard while the technical wizardry of the world's only military superpower offers an invisible shield to detect and deter any intruders. That is the theory. Or, rather, was the theory. One Nato figure said the effect was "as big a shock as the Russians launching Sputnik" - a reference to the Soviet Union's first orbiting satellite in 1957 which marked the start of the space age. 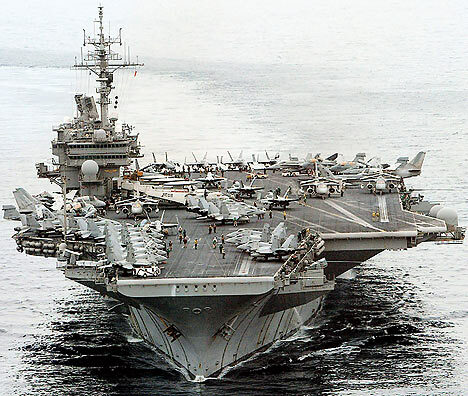 The lone Chinese vessel slipped past at least a dozen other American warships which were supposed to protect the carrier from hostile aircraft or submarines. And the rest of the costly defensive screen, which usually includes at least two U.S. submarines, was also apparently unable to detect it. According to the Nato source, the encounter has forced a serious re-think of American and Nato naval strategy as commanders reconsider the level of threat from potentially hostile Chinese submarines. It also led to tense diplomatic exchanges, with shaken American diplomats demanding to know why the submarine was "shadowing" the U.S. fleet while Beijing pleaded ignorance and dismissed the affair as coincidence. Analysts believe Beijing was sending a message to America and the West demonstrating its rapidly-growing military capability to threaten foreign powers which try to interfere in its "backyard". 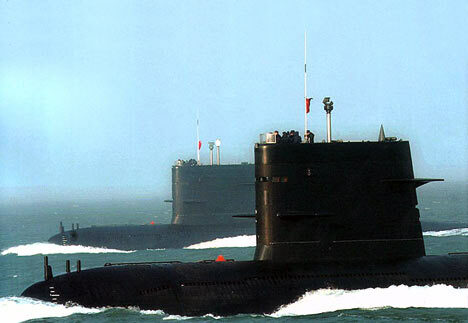 The People's Liberation Army Navy's submarine fleet includes at least two nuclear-missile launching vessels. Its 13 Song Class submarines are extremely quiet and difficult to detect when running on electric motors. Commodore Stephen Saunders, editor of Jane's Fighting Ships, and a former Royal Navy anti-submarine specialist, said the U.S. had paid relatively little attention to this form of warfare since the end of the Cold War. He said: "It was certainly a wake-up call for the Americans. "It would tie in with what we see the Chinese trying to do, which appears to be to deter the Americans from interfering or operating in their backyard, particularly in relation to Taiwan." In January China carried a successful missile test, shooting down a satellite in orbit for the first time. constitutional911 on Sat, 11/10/2007 - 3:03pm. I was having a discussion with someone, and I was looking for quotes from Bush and others along these lines. I seem to remember that on 9/11 there were statements from Rumsfeld and/or Wolfowitz to the effect that the attacks represented opportunities, or were otherwise good things. gothamite on Sat, 11/10/2007 - 5:23pm. Here's a hell of a quote. Bush spoke before Congress on September 11, 1990, delivering a speech which he entitled "Toward a New World Order". Addressing the subject of his Gulf War, he made his first public utterance of his, and his rich cronies' plans for a world imperialism in stating that the war in Iraq was "...a rare opportunity to move toward an historic period of cooperation. Out of these troubled times...a new world order can emerge." Keep the work up. This could be fun if we succeed. Orangutan. on Sat, 11/10/2007 - 6:32pm. Rumsfeld on 9/11 mentioned to aides that he wanted 'the best information fast'--in particular, information that could be used to justify invading Iraq, and not just going after 'UBL' (bin Laden). His remarks included the phrase, 'sweep it all up, things related and not' (i.e., even governments unrelated to the 9/11 attacks might be targeted for invasion and overthrow). How do we know this? I believe it was from notes hastily written down on a memo (in Rumsfeld's hand, or one of his aides? ), and I'm not sure how those notes surfaced and came to be reported. rm on Tue, 11/13/2007 - 7:31am. As my Webster's has opportunism: the practice or policy of adapting one's actions, judgments, etc. to circumstances, as in politics, in order to further one's immediate interests, without regard for basic principles or eventual consequences - opportunist. Most sensible men would eventually jump off of a bridge, or turn themselves in for a lifetime of toast, mush, a cup of coffee, and "line up!" Beef Stew on Sat, 11/10/2007 - 9:55pm.